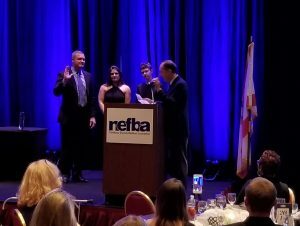 On Friday night, our very own Sean Junker was elected as the 75th President of the NEFBA – Northeast Florida Builders Association! As he was sworn in by former President Bill Cellar, his wife, Amber Junker, and his son Ethan, were by his side and the Providence Homes team was also in attendance. We can’t wait to see what the future holds with Sean at the helm.